Public transportation to JFK: Take the quick and easy AirTrain. Consult a New York City Subway Map to determine the best connections to take to get to your destination. If you return to JFK via subway, make sure to take the A train marked Far Rockaway or Rockaway Park, NOT Lefferts Blvd. Taxis: $52 flat fare (plus tolls) as of 2018 to any Manhattan location. 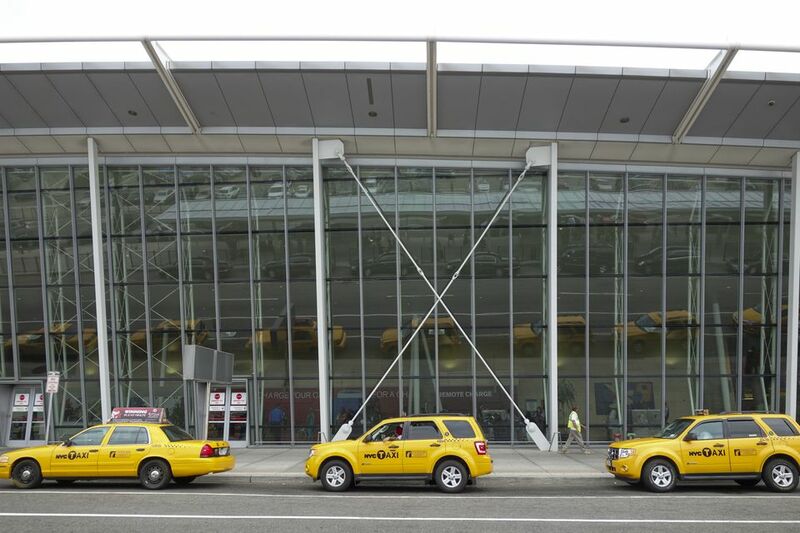 Taxis are available outside of every terminal and there is typically a taxi stand where you will be directed to a taxi. You may also want to familiarize yourself with the Taxi Rider's Bill of Rights. There is no additional charge for luggage and rates are based per car, not per passenger (up to four passengers). To return to JFK from Manhattan, taxis will charge you the metered rate, plus any applicable tolls. Car services: Prearrange for a car service to meet you at the airport, or call one when your flight touches down. This is a great option if you want to avoid waiting in line for a taxi or if you have a group larger than four people and want to arrange for a van or limousine. Go Airlink NYC: Go Airlink NYC offers shared transfers from JFK (starting at $18/person), as well as private transfers via sedan or van for groups. Rides are available 24 hours a day, though wait times for shared transfers at night may vary. NYC Airporter: There is also complimentary hotel shuttle service for hotels between 23rd and 63rd Streets from Grand Central. The official bus service of NYC area airports offers transportation between Penn Station, Port Authority and Grand Central and JFK. The service operates 6 a.m. to 11:30 p.m. daily. There is also complimentary hotel shuttle service to hotels between 23rd and 63rd Streets from their Grand Central stop. Super Shuttle: Available 24 hours a day, this shuttle provides door to door service for your party. No reservations are required to get from the airport to your destination, but they are required for your return trip to the airport. Rental cars: We discourage visitors to New York City from renting cars, unless they're planning extensive travel outside of the major metropolitan area. Parking is both expensive and difficult to find, and you will find your money better spent on mass transit and taxis. Parking at JFK: If you need to park your car at JFK, there are several options. Short-term parking is available if you're picking up/dropping off at the airport, and long-term parking is available if you're leaving your car overnight or longer. If you want to save money, compare rates on on-site and off-site airport parking options at JFK. Hotels near JFK: Sometimes it's just easier to stay at the airport for an early flight or if your flight is canceled. There are quite a few options for airport hotels in NYC.